Aria is a big fan of jumping as most baby’s are. 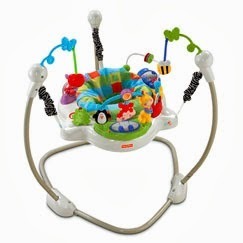 If you’re arms are getting tired of constantly bouncing them on your lap or ground, then you need the Fisher Price Discover n Grow Jumperoo. It truly is one of the best baby toys I’ve came across. Aria loves it, I love it, the boys love it, everyone loves it. There is so much for baby’s to do with the Jumperoo, it plays music both tunes and bouncing sounds, lights on a wee piano style section, a monkey to hit, a roller ball to spin, a froggy teether, a spin a round penguin, mirror to look at that cute face, little circles to move from one side to another, a hanging bird and bee to reach up to. The sit can spin 360 degrees so baby can reach every toy their heart desires. So many things to do and so much fun to be had. The frame is sturdy and you don’t have to worry about it tipping or wobbling about. When I saw it was suspended and the baby could jump, I was worried about her fingers being trapped in springs, but I needed have worried. They are covered with soft material. You can also adjust the size as your baby grows. Aria is still on the first setting at 8 months. The maxiumum weight is 11kg so plenty of growth there and can go in to the Jumperoo as soon as they can hold their head up confidently. As you can see in the picture below Aria loves it. Did you know that jumping around increases the baby’s motor skills? And the colourful toys, sounds and music help enhance the baby’s senses which are developing all the time. I built this up in less than 10 minutes, it was easy to follow the instructions and the toys clipped into their alloted spaces easily. There was no delay in Aria having fun on the Fisher Price Jumperoo and the boys enjoying the box it came in. Win win. 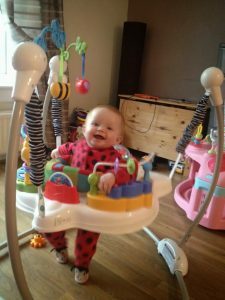 The Fisher Price Discover n Grow Jumperoo is one of the best things I’ve seen for babies, they really do love it and I’ve recommended it to any friends with babies and everyone of them loves it. The only problem is trying to get a picture of them in it, as they don’t stay still for a second. I have so many blurry pictures. Aria loves all the toys that are in this and there is a little spare tray that you can put some hand held toys in. I managed to get a little video of Aria jumping in this, so you can see it in action. It’s not great but you get the idea. We love the Fisher Price Discover n Grow Jumperoo and cannot recommend it enough for growing baby’s.